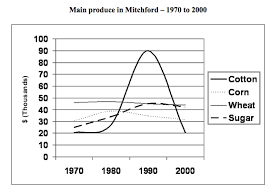 The graph compares the consumption of the top four types of agricultural products in Mitchford over a period of 30 years. As an overall, cotton was by far the most important produce contributing to the Mitchford economy due to its increased demand between 1980 to 1990. The production of wheat, corn and sugar were comparable and remained relatively constant over the period shown. In 1970, wheat was the main produce making just under 50 thousand dollars for the city. During the same period, the money which came from corn and sugar produce were comparable with 25 and 30 thousand dollars respectively. However, cotton provided a negligible amount of 20 thousand dollars and just one year later, cotton overtook wheat in making a contribution to Mitchford agriculture. From 1970 to 1990, this city saw a considerable increase in cotton consumption until it reached a peak of 90 thousand dollars. The figure for corn fluctuated slightly and stabilised for the rest of the period. In the early 2000, the production of sugar, wheat and cotton were equal and tended to decrease since then. While cotton production fell roughly again to 20 thousand dollars and was likely to follow this trend, the other three ones varied slightly and may go up after that. A graph was provided showing the 4 top farming products of Mitchford City. The products, including their selling price in dollars were monitored over the decades from 1970 up to 2000. This essay will present a more detailed analysis of the graph and the information that accompanied it. While your grammar is not perfect, it did not pose any stress on the reader. Your information was understandable and a degree of analysis is evident in your work. This is a pretty good attempt at writing a task 1 essay. Save for the missing summary statement, which is a requirement of the essay, you did an acceptable job of writing the body paragraphs though. @Holt Thank you so much. I have some questions for you. In task 1, writing an opening summary or concluding summary, which one is better? Do I need to write both of them? And how many words should task 1 need to have? I feel quite confused. Thank you again! "cotton was by far the most important produce". It's better if you change "produce" to "product"
Regarding relative clauses, you should use "that" instead of "which". You aren't wrong, but it sounds more native. ...production of sugar, wheat and cotton were equal and tended to decrease since then --> wheat and cotton were equal, and they tended to... You should separate them into two clauses because they are not parallel. Hi jadeatoz, you may also mention that the only overall consumption increase throughout the 30-year period was in sugar.